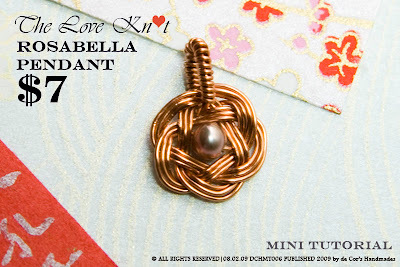 Learn to create this beautiful Rosabella Pendant on the fly! This tutorial is categorized under Mini Tutorial Series. This tutorial caters for all level of people who does wire jewelry. The tutorial delivers 6 simple steps to create this pendant, learn this to create them as a valentine's gift that everyone would wear on daily basis! PLEASE BE INFORMED THAT THE "ALL 8 TUTORIALS" and "ANY 3 TUTORIALS" packages does not include this tutorial. Using jig will help producing more consistent result for this design. I use WigJig Centaur in this project. There are total of 6 steps in making this pendant, to deliver the clearest instruction, the beautifully taken 38 pictures will provide you the means from end to end to make this pendant. In this document, it also listed out the tools and materials being used. This lesson shows how to develop a pair of beautiful Rosabella Pendant.